Did you ever stop to think about how much you use your hands every day? They help us to do so many things- dressing, eating, and writing to name a few. Fine motor skills, or the combined use of our hands, fingers and thumb, are such a big part of how we function, yet not often something we think of as a skill set to be practised and learnt. Now imagine a couple of scenarios like trying to do up your shoes or pour water into a cup. Both possible, yet slightly unimaginable and (inconvenient) tasks to manage without the use of our five-fingered-friends. The development of motor skills happens slowly over time. From the moment we are born the grasp reflex allows us to instinctively grab and feel objects, helping us to develop our sense of touch and also growing neural pathways. As we grow we strengthen muscles, increase coordination and judgement, building up our repertoire of movements and our ability to make more complex and controlled movements. There are many ways to ‘build-up’ fine motor skills’ of which arts and crafts play an active role. 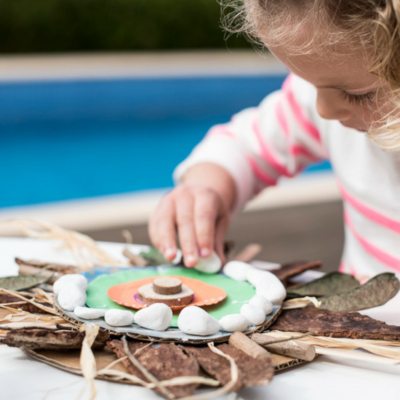 Here are some things to think about when using art and crafts to encourage your child’s fine motor skills; building up, strengthening and fine tuning their skills. Drawing: For very young children use drawing materials that are wider and easier to grip and control. Focus on making marks in the beginning, scribbles and circles will progress to more recognisable shapes as they experiment and build up control. Try not to focus on hand dominance and pencil grip in the early years, this will come around kindy/ pre-school age. Painting: Finger painting although messy is a great way to start then progressing to easy to grip brushes with big bristles and changing to finer ones as they grow older and begin to add detail. Cutting: The squeezing action of scissors is a great way to build up hand strength. Choosing scissors appropriate to your child’s age, size and ability will make the difference with their success. Allow young children to experiment with random cutting and ‘graduate’ to cutting along lines and around shapes. Demonstrate correct hand grip and tucking in arms as you cut. Hole punching: Hole-punchers come in a variety of shapes and sizes and can be a great way to engage your child in fine motor development. Link this with cutting and threading to make mobiles and jewellery or shapes to be added to pictures too. Glueing: There are not many young children that are not fascinated with this process! Of course the glue you use will depend on the materials and activity. Glue-sticks and pot glues(clag etc) for paper but for heavier objects slightly watered down PVA glue works a treat. Cutting, picking up and placing objects are all great for building up hand strength, coordination and strengthening pincer grip. Threading: Beads, pasta shapes, hand cut and hole-punch paper are all great ways to start. Using thread that is slightly stiff will alleviate some frustration in the early years! Building: Using found objects such as boxes, popsticks, twigs etc can spark the imagination and encourage hands with 3D object making. Masking tape can be easily used and painted over. Sculpting: Softer materials such as playdough, salt dough and clay are perfect for young hands whilst older children may enjoy the challenge of using plasticine, modelling clay and air-dry clay to mold and shape. There are so many benefits to these types of activities. 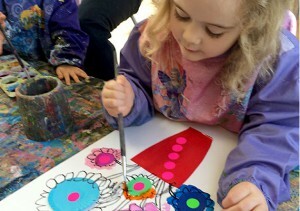 During each term at Little Picassos, Pee Wee and Preschool activities are carefully planned with fine motor skill development in mind, aiming to incorporate a range of fun activities each week, building strong hands, coordination and a love of all things arty whilst incorporating knowledge of colour, shape and line as they go. New experiences and art concepts are then introduced and refined as they move towards Adventurers, Explorers and Advanced programs. 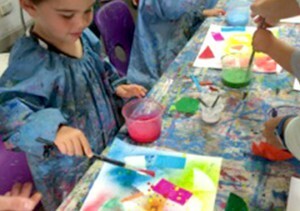 Our school holiday programs also offer a wonderful variety of mediums and materials to explore and are a fabulous introduction or continuation of each child’s skill development whilst being a fun outing in which they can embrace their creative side.